FT-817ND, Wolfi interface and BLU LIFE ONE X2 phone running DroidPSK and my 35 ft wire antenna, ready to deploy for PSK-31 QSOs. 2018-08-16 I've been playing CW with my FT-817nd and a 35 ft end fed antenna for a few weeks now. It is amazing what you can do with five watts and a simple antenna. Two days ago I noticed that there were very few CW signals on the bands but quite a number of PSK and other digital signals. That motivated me to set up my Wolfi-link digital interface with my current phone, a BLU LIFE ONE X2 that I've been using with StraightTalk for a couple years. The software is DroidPSK by Wolfi Solutions. The good news is that It all works! I didn't have a serious QSO with it today but my neighbor and I worked each other on our dummy loads just to see if everything works as it should. AND it does! Setup for the QSO with W4FGA. Galaxy S2 phone in foreground running DroidPSK. Wolphi-Link interface behind the phone and the FT817nd in upper left. The Tuna Tunah II tuner is out of the picture. 5/12/15 Having upgraded my Android phone recently to a Samsung Galaxy S3 I have an "old" phone laying around. As I've played with my potential backpacking package I have noted that there is likely more activity on digital modes, particularly PSK-31 than CW. That led me to think about an AFSK project I worked on a couple years ago with W8DA of Wolphi-Solutions. The physical interface, now called the Wolphi-Link is in a tiny little box about 2" by 1-1/4" by 3/4" that connects your Cell phone to your radio, in my case a Yaesu FT-817nd. It provides the audio interface and PTT (push to talk) control for your radio and combined with the DroidPSK App allows you to have a PSK QSO without a laptop computer. A home brew version of the interface was described on page 30 of the May 2012 issue of ARRL's QST magazine. 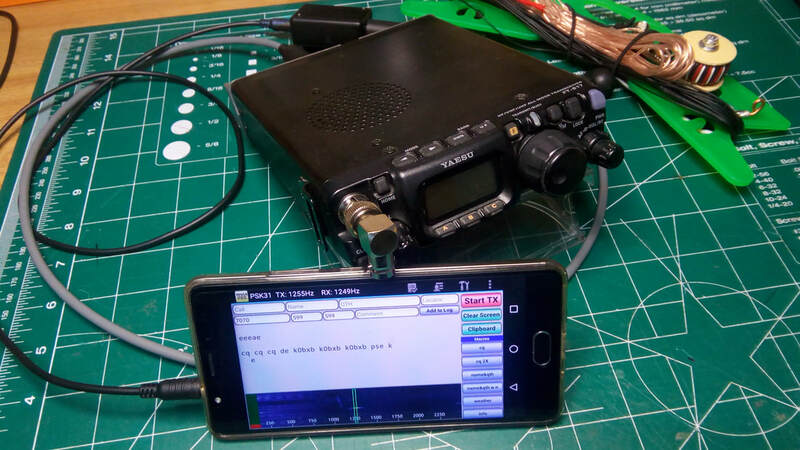 So I hooked the interface to the Galaxy S2 phone and FT-817nd transceiver which in turn was connected through my Tuna Tunah II tuner to a 33 ft 20 meter end fed half wave wire slopes upward from my ground level shack window to about 15 feet in a pine tree nearby and gave it a try. The thrill of ham radio returned when W4FGA in Georgia, about 700 miles away, came back! We had a nice little 599 QSO! Admittedly it would be a bit inconvenient to have a half hour rag chew with the little onscreen keyboard but the customizable Macros allow you to put together a good exchange which is what most of us do anyway. I offloaded almost everything else from the phone (which I no longer use as a phone) other than the DoridPSK app, turned off all RF communications on the phone and did everything I could to minimize battery usage as my primary objective is to use it where I'll have no options for charging. I'll be fully dependent on the energy I carry with me in the backpack (including food!). If you are at all interested in playing with the "ultra portable" digital idea, take a look at Wolphi-Solutions. I'm not getting paid to say that, I just think Wolfgang has a good solution. OK, now what else can I try that takes no weight and works communications miracles! ?